Google's "nine eyes" of Street View snap a self-portrait ascending Tilton Rd. 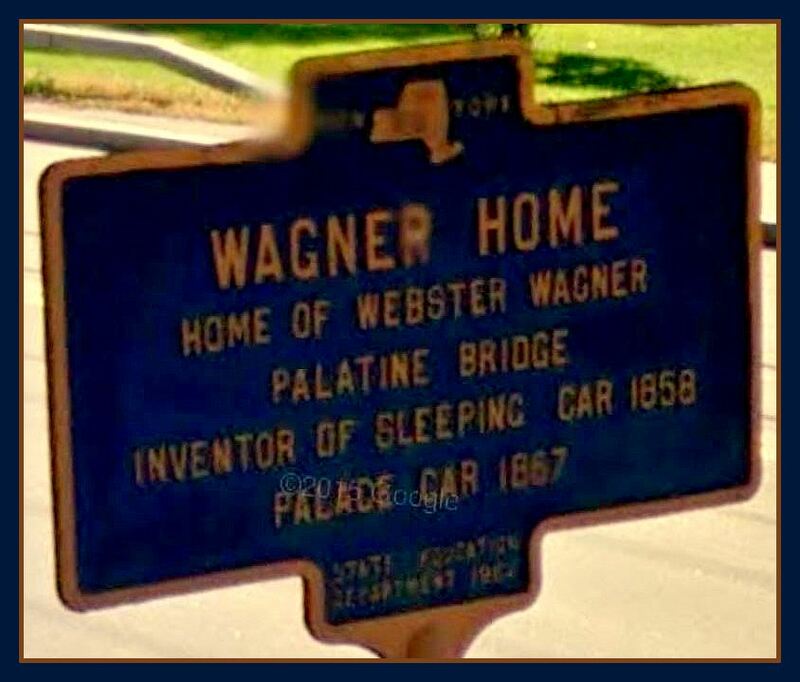 "The Wagner Palace Car Company was one of the largest employers in Buffalo in 1890. Its works occupied 35.7 acres at 1770 Broadway out at the east end of Broadway near Broadway and Bailey. 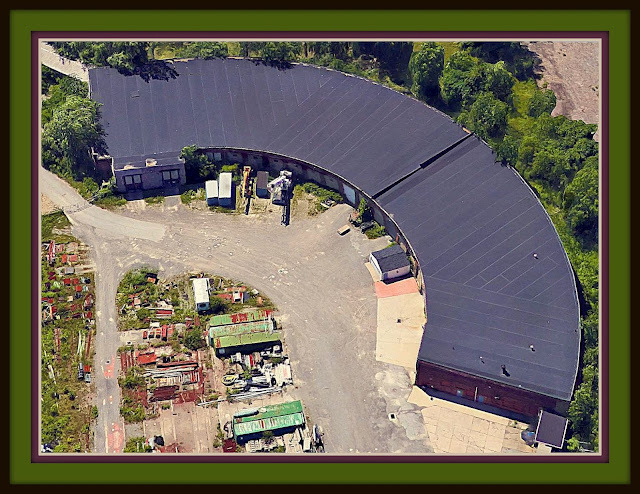 In addition to brass finishers, the company employed blacksmiths, car builders, carpenters, carvers, marble finishers, steamfitters and even a storekeeper!" 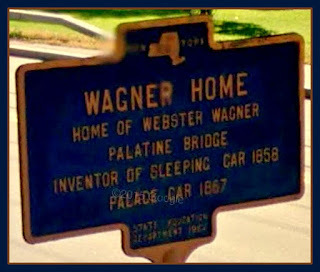 The Webster Wagner home in Palatine Bridge NY caught my attention as I journeyed down route 5 on Google Street View from Albany to Utica. By the time photographer Arthur Harvey stopped by, things were looking dire. The wrap-around porch on the right had vanished. Photos that were included with nominating papers for the Wagner home's inclusion in the National Register of Historic Places show the home was intact at the time of filing, 22 March 1973. In Webster Wagner's lifetime, this residence was a showplace. It was filled with life and distinguished guests. Its fate, however, was not determined by its original owner or his family. 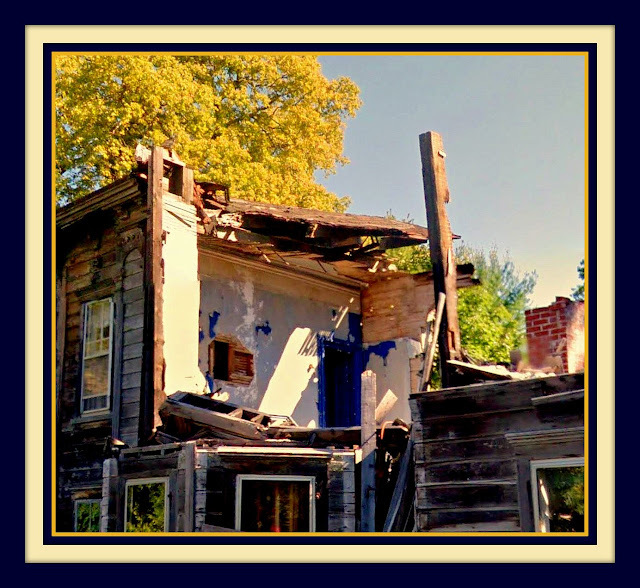 "Historic home is facing at least some demolition"
"Time and years of neglect by longtime village recluse Barry Woods have taken their toll." Mr. Woods occupied the back addition to the home for many years. He was resistant to the entreaties of his fellow citizens to restore the home, yet would not leave until local authorities forced him out when the structure began to collapse around him. Woods simply abandoned the place and ran away, leaving vehicles and other personal property behind. Since he did not pay taxes on his property and did not respond to registered mail, the Village sold the landmark home's remains at tax auction for $1,000 to Herbie Ambrose of Arizona. After being issued several citations for code violations, Mr. Ambrose sold out to Andre Anasta of Catskill NY. 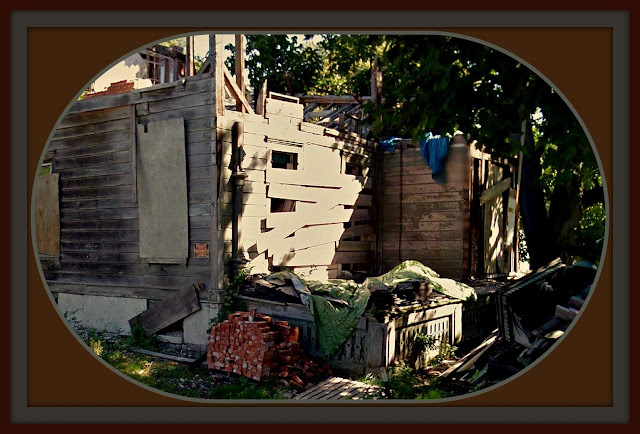 As of 2014, Mr. Anasta was in the midst of a controlled demoltion of the structure. Additional details of this tale can be found in an article by Joshua Thomas, Courier Standard Enterprise editor, published 12 March 2014, "Demolition Permit Issued for Condemned Webster Wagner House." 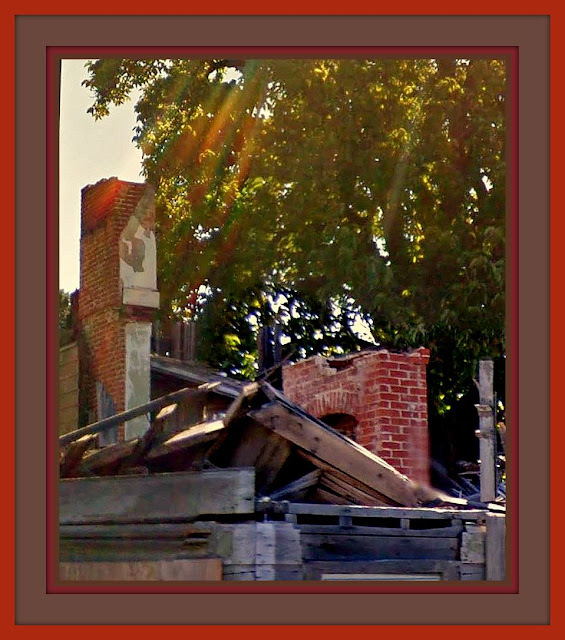 The heavy slate roof was beginning to weigh down the slowly rotting beams and would soon collapse. Two years later, in March of 2014, photographer Rob Yasinsac took a great set of photos detailing the building's state of decay for HV-Rob, Hudson Valley Ruins. The comments on Rob Yasinsac's post include remarks from Jason Coppernoll's grandson. Jason Coppernoll owned the home at the time it was placed on the National Register of Historic places in the 1970s, and was the last owner to adequately maintain the property. 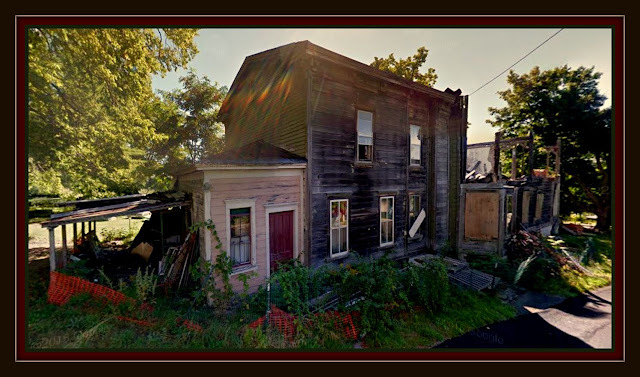 A photo essay appeared on 24 April 2014 in the Canajoharie Courier-Standard-Enterprise that featured a tour of the devastation with the latest owner, Pierre Anasta. At that point much of the structure was still sort-of standing, though precariously and Pierre was proceeding cautiously with demolition. Four days later John Mason followed up with a long article in Hudson NY's Register-Star, explaining that the current owner was attempting to salvage whatever could be saved for later sale to interested parties to help finance a local gymnasium. The Mason article includes excerpts from interviews with former residents and visitors to the home. The front porch roof and upper floors have been removed. As of Google's 2015 sighting, only the two service wings remain. the rest of the structure deteriorated. 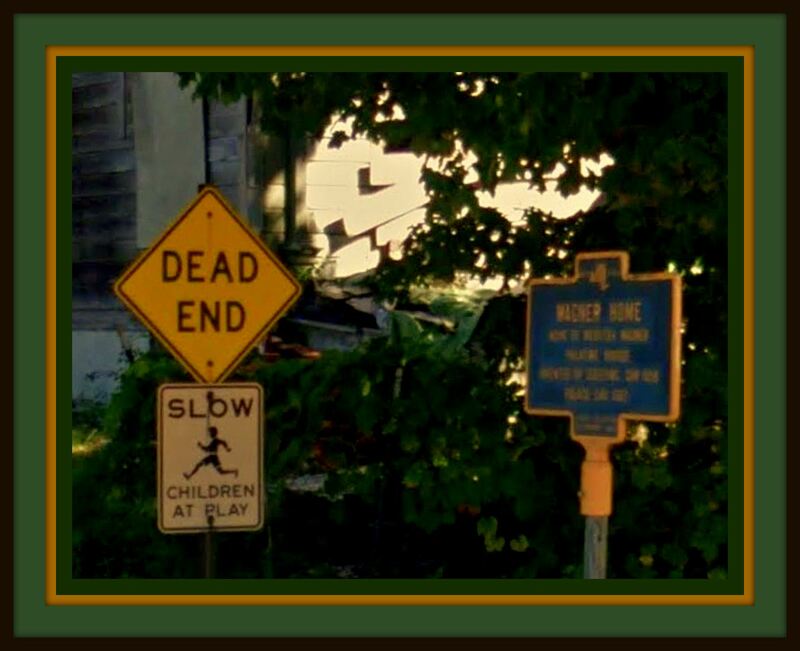 Have preservation efforts reached a dead end as of 2016? Yes, for the time being. what is left remains in private ownership. Things look dire. It appears salvage efforts have been suspended. It seems the owner may not complete the demolition anytime soon. Meanwhile, hopefully no children will be playing anywhere near this dangerous structure!